The results are in for Polished Palate’s 5th Annual International Rum Competition and the Best of Show belongs to Zafra Master Reserve 21 Rum from Panama. We sampled this aged rum for the first time this past February at the South Beach Wine & Food Festival and thought it was special - particularly when damping the alcohol with a drop of water. But Best of Show - we would never have predicted. particularly since each judge has to rate the spirit with an overall score of 90+. "Master Distiller Francisco ‘Don Pancho’ Fernandez has done it again." Accolades should also be given to Khukri Rum from Nepal which earned its fifth consecutive gold medal as well as its second "best of category" category award. Who knew they crafted rum in the Himalayas, and in particular, gold medal quality rum. The Diplomatico Blanco, which we also tasted for the first time in South Beach, also was awarded a Gold medal. And the employees at Ron Abuelo must be proud of their two gold winning products, the Ron Abuelo 7 Anos and Ron Abuelo 12 Anos. The one unexplained mystery, what happened to Ron Zacapa? * Gold: Don Q Cristal, Puerto Rico; Diplomatico Blanco, Dominican Republic. * Silver: Siesta Key Rum, Florida; Ron Barcelo Gran Platinum, Dominican Republic. * Bronze: Carta Viejo Claro, Panama; Koloa White Hawaiian Rum, Hawaii. * Silver: Bacardi Gold, Puerto Rico; Koloa Gold Hawaiian Rum, Hawaii. * Bronze: Don Q Gold, Puerto Rico; Old Lahaina Premium Gold Hawaiian Rum, Hawaii. * Gold: Khukri Rum, Nepal; One Barrel Rum, Belize. * Silver: Koloa Dark Hawaiian Rum, Hawaii; Carta Vieja Anejo, Panama. * Bronze: Old Lahaina Premium Dark Rum, Hawaii. * Gold: Ron Abuelo 7 Años, Panama; Bacardi 8, Puerto Rico; Ron Abuelo Añejo, Panama; Ron Medellin 8 Year Old, Colombia. * Silver: Ron Barcelo Imperial, Dominican Republic; Plantation Barbados 5 Year Grande Reserve, Barbados; Ron Medellin 3 Year Old, Colombia; Ron Viejo de Caldas 3 Year Old, Colombia; Ron Viejo de Caldas Grand Reserve, Colombia. * Bronze: Don Q Añejo, Puerto Rico; Ron Carupano Oro Reserva Especial, Venezuela. * Gold: Ron Abuelo 12 Años, Panama; Don Q Grand Añejo, Puerto Rico; Ron Carupano Solera Centenaria Reserva Limitada, Venezuela. * Silver: Diplomatico Reserva Exclusiva, Venezuela; Plantation 20th Anniversary, Barbados; Vizcaya VXOP Cask 21 Cuban Style Rum, Dominican Republic. * Silver: Bacardi Reserva Limitada, Puerto Rico; Ron Millonario Solera 15 Reserva Especial, Peru. * Silver: Don Q Coco, Puerto Rico; Don Q Limon, Puerto Rico. * Bronze: Aguardiente Antioqueño Sin Azucar, Colombia. When our son requested a moon bounce for his birthday, we dreaded the idea of hosting it at a bounce facility at an industrial warehouse. Yea, there are benefits - come and go with no setup or cleanup - but we decided to stretch our imagination and bring the moon bounce to our favorite place in the country: Corcoran Vineyards. The only restriction Jim and Lori Corcoran applied was no outside alcohol - which why should we when we had ample access to Lori's Chardonnay, Cabernet Franc, and Malbec. Big Country Amusements provide the pirate module at a reasonable price and setup the bounce right outside Corcoran's tasting room. The other attraction for the kids was ample space for frisbees and kites as well as a stocked - catch and release fish bond. Even with a slightly chilly day - the setting was way more enjoyable than an industrial warehouse. This may become an annual event. In our travels at Wine-Compass.com we've met many micro-brewers and wine makers who first received training in their craft by manufacturing beer or wine at home. This list includes many of today's most popular brewers, including Sam Calagione of Dogfish Head Craft Brewery and Jim Koch of The Samuel Adams Brewery. Koch still supports the homebrew movement with the Samuel Adams American Homebrew Contest where the brewery crafts the winner's brew. 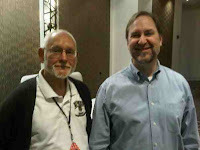 And homebrewers even have their own support group, the American Homebrewers Association. Yet, there are no similar exemptions for home-distilling; partly because the government puritans want to control people's behaviors regarding hard alcohol. In fact, distillers were the main targets of the 18th Amendment which outlawed the manufacture of alcoholic beverages with 40% alcohol. It wasn't until the Volstead Act which outlawed the manufacture of alcoholic beverages with 1.2% alcohol, where wine and beer production was virtually eliminated. Yes, sacrificial and small qualities of home winemaking were still permitted. But the primary restriction to home distilling is the federal government's unending thirst for tax dollars. Approximately 32% of the purchase price of a 750ml bottle of your favorite spirit goes to Uncle Sam or states. "That's more than three times the tax on wine, and twice that on beer." So yes, you can distill spirits at home, put the government forces you to undergo the same agonizing process that commercial distillers experience. Yet, the U.S. government allows the purchase of a one gallon still for the purposes of distilling water and essential oils from plants. There are many online providers of distilling equipment such as Home Distilling Shop. And it is legal to research and distribute information about distilling alcohol. But remember, it is not the distillation process that creates alcohol - its fermentation. So maybe there are still some brave souls out there experimenting with distilling micro batches of fermented grappa, corn whiskey, applejack, plum brandy - you name it. 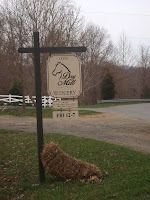 This weekend we finally visited Dry Mill Vineyards & Winery, another infant winery located just outside Leesburg, Virginia. Actually, the winery is only a year old, but the Vanhuss family has been growing grapes in their Lovettsville vineyard for over a decade. Many of these grapes have gone into making Naked Mountain's award winning Chardonnay. 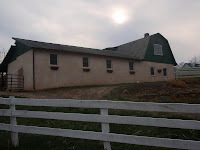 When the stable and barn that housed the horses and dogs of the Loudoun Hunt Club became available they swooped in and purchased the property. A winery was born. 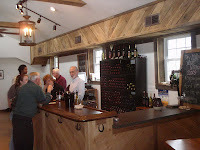 While they converted they former Hunt Club stable into a tasting room, the contracted with Kerem Baki to produce the wine at Hillsborough Vineyards. Before our visit, we had called ahead to confirm that NCAA basketball was playing on the big screen. The renovated Loudoun Hunt Club stable was a work of art; they used as much of the original wood as possible as well as the original large wooden storm shutters that kept the horses warm in the winter. Where these horses once slept, we planted our feet in front of the tasting bar. Dry Mill's offerings contains many traditional Virginia wines: Chardonney, Viognier, Cabernet Franc, Norton, and Traminette. They enhance their portfolio with a Syrah and an off-dry Rose - made from a blend of multiple grapes. We started with several, actually, quite disappointing wines. The Traminette had a powerful floral aroma, but like the Steel Chardonnay that followed, the flavor was weak. This was particularly surprising since their grapes had gone into Naked Mountain's chardonnay. And their Barrel Chardonnay had too much of a spicy finish for our tastes that overwhelmed any chance to savor the chardonnay grape. After not caring for their Syrah - we were ready to throw our hands in - but then came the Cabernet Franc. Finally, a really good wine - full bodied, with flavor - smooth - but with a hint of a spicy finish. Their Norton followed and this was one of the better versions - they have extracted the acidic grapey characteristics inherent with the grape and produced a full bodied, smooth wine. There are no astringent acids effecting the tongue, so you are free to enjoy this wine; and the touch of Mourvedre really gives some additional flavor and smoothness. We finished with the Rose, both chilled and at room temperature to see how serving warmer increases the wine's sweetness. Unfortunately, the winery doesn't provide a sample of their Viognier, since it was selected as one of the tops in the area. We decided to purchase a body anyway and spent the remainder of the afternoon on their back patio enjoying the day. And yes, this is one fine wine - apricot flavors throughout. This and their Cabernet Franc will pull us back in. It also helps that their back patio provides a relaxing environment and the winery provides live music on occasion. And as their other wines improve - this will be one of the top attractions on the Loudoun Wine Trail. The Virginia Wine Marketing Office and the Virginia Tourism Corporation today announced Love By the Glass, the first-ever Virginia Wine Week. Wine lovers will celebrate Virginia Wine Week March 22-28, 2010 at more than 100 participating restaurants and wine shops across the state. Virginia Wine Week promotes restaurants and wine shops who offer Virginia wine for sale by the glass. From March 22 to March 28, participating businesses will add at least two Virginia wines for sale by the glass to their menus and merchandise. Look for Virginia Wine Week posters, menus and decals or visit www.VirginiaWine.org to find participating businesses. Virginia is home to more than 155 wineries across the state in nine different wine producing regions. The state is getting national recognition for several varietals including Viognier, Cabernet Franc and Petit Verdot; and it is producing a growing variety of wines quickly gaining a loyal following including Bordeaux styles blends, sparkling wines and the native varietal Norton. Virginia was named one of the top five up-and-coming wine destinations by Travel + Leisure magazine in 2007. Restaurants and wine shops interested in participating in Virginia Wine Week have until March 15 to register by calling the Virginia Wine Marketing Office at (804) 344-8200. Visit www.VirginiaWine.org for more information about Virginia Wine Week, including a list of participating businesses. Or Wine-compass.com for a list of wineries in your area. For more information about visiting Virginia, go to www.Virginia.org or call 1-800-VISITVA to request a free, Virginia is for Lovers travel guide. As the rum controversy heats up between Puerto Rico & the USVI (Modern Distillery Age, March 9) rum is about to make more headlines. The 5th Annual Polished Palate International Rum Competition takes place this week in Tampa’s Ybor City at the Hilton Garden Inn. Hosted by Jack Robertiello/Drinks Ink, judges Arturo Sighinolfi/SWS, Luis Ayala/Rum Shop, Stephen Beaumont/World of Beer, Ian Williams/Author & Rum Pundit, Harriet Lembeck/Wine & Spirits Educator, Ben Montgomery/St. Petersburg Times and Anthony Nasso/Republic National Distributing Company will be evaluating dozens of rums based-upon five criteria: appearance, aroma, taste, mouthfeel & finish. While all criteria are important in establishing a rum’s signature profile, aroma and flavor rank highest in scoring, and, of course, mean the most to rum lovers. ‘Nosing’ a spirit is a science—and there are specific techniques employed to ascertain scores. Lorena Vasquez, Master Distiller of the highly regarded Ron Zacapa rums, approaches the glass first within a breadth of the front rim, then moves her nose to the middle of the glass and finally against the far rim. Trying this for the first time is an eye-opener as each ‘nosing area’ offers subtleties one might anticipate during the tasting process (top note, mid-palate and finish). A simultaneous technique is to quickly inhale through both the nose and the mouth. The result leaves a foreshadow of the taste of what’s in the glass. Spirits are always tasted ‘neat’, and, they’re tasted repeatedly throughout each session. For example, once air enters a glass, the essence of the rum begins to open up and, the longer it sits, other nuances will come to light. Some tasters put a dash of water (optional) which dampens the alcohol and brings up the flavor. Results of the 2010 competition will be posted next week. On the heels of us sampling our first Turkish made wines, We read a press release this week announcing that the "Wines of Turkey Kicks off Promotional Campaign". And "a blind tasting of 49 wines from 16 wineries gave Kavaklidere, consulted to by Bordeaux-based Stephane Derenoncourt and the only Turkish winery exporting to the USA (House of Burgundy in NY and Four Potomac Wines in DC), overall honors". Kavaklidere was the winery which produced the wines we have access to purchase. The Wines of Turkey also provide an informative website that lists and describes the major grapes, regions, and wineries. Navigate over, its worth a read. When is a Zin not a Zin? David Gates, vice president of vineyard operations at Ridge Vineyards is our source for everything Zinfandel, Carignane, and Petite Sirah as well as the winery's esteemed Monte Bello. These are the grapes most often used in their Zinfandel blends made at the Lytton Springs facility. Mr. Gates is quoted in this nice article from the Los Angeles Times concerning Zinfandel. The article explains why Zinfandel based blends are excellent wines, but are not as profitable - they are difficult to sell. We sometimes forget the wineries are businesses - the profit motive is a fact of life. The ninth annual Food Network South Beach Wine & Food Festival, February 25–28, 2010, was once again a successful and unforgettable extravaganza. More than 50,000 guests attended the four-day event, and over $2 million was raised for the Florida International University (FIU) School of Hospitality and Tourism Management and the Southern Wine & Spirits Beverage Management Center. Dozens of high-profile national media outlets covered the Festival, from Food Network, Travel Channel Europe, Esquire, People, Extra, TIME, Food Network Magazine and The New York Times to the Associated Press among others, with a cornucopia of legendary chefs and culinary personalities holding court throughout the event. Major new and returning sponsors for 2010 included Food Network, Food & Wine, The New York Times, Wine Spectator, Whole Foods Market, South Beach Diet, American Express and Allen Brothers. The Festival and Southern Wine & Spirits of America hosted a Kitchen Aid dinner on Wednesday, February 24 at Miami’s iconic Haitian restaurant Tap Tap. Chefs Daniel Boulud, Jose Garces, Masaharu Morimoto, and Kris Wessel provided the menu to help raise significant funds for the Partners in Health Haiti earthquake relief fund. The Amstel Light Burger Bash hosted by Rachael Ray crowned a new winner of the Amstel Light People’s Choice Award – Chef Michael Symon of Iron Chef America fame, who won for his delicious “Fat Doug” – cheeseburger with Swiss cheese, pastrami and coleslaw. Miami’s own Chef Michael Schwartz won the Allen Brothers Golden Grill Award. Other signature events included the Perrier-Jouët BubbleQ, hosted by Emeril Lagasse; Wine Spectator’s Best of the Best returned to the Fontainebleau with French Ambassador to the United States, the Honorable Pierre Vimont in attendance, as well as the best wines and Champagnes being poured plus a veritable who’s who of the country’s greatest chefs – Scott Conant, Masaharu Morimoto, Alfred Portale, Michael Psilakis and Laurent Tourondel, just to name a few. The Whole Foods Market Grand Tasting Village featuring the American Express Grand Tasting tents, continued to draw huge crowds for the ultimate tasting experience, and at the end of the weekend this event was able to donate over 2 TONS of food to Feeding South Florida. South Beach Diet presents Fun and Fit as a Family featuring the Kellogg’s Kidz Kitchen, a two-day mini-fest at Jungle Island addressing the vital topic of childhood obesity prevention, nutrition education and fitness, returned and featured chefs and culinary personalities Paula Deen, Rachael Ray, Guy Fieri, and Rocco DiSpirito, among others. Advance proceeds from this event raised over $20,000 for the William J. Clinton Foundation for Haiti Earthquake Relief. The all-star Tribute Dinner held at the Festival’s host hotel, Loews Miami Beach, sponsored by Bank of America, (a part of The New York Times Dinner Series) honored the legendary Daniel Boulud. Beautifully emceed by Top Chef host Gail Simmons, the dinner featured a sumptuous Louis Roederer Cristal Champagne reception and dinner, perfectly paired with Diageo Château & Estate Wines and created by an impressive group chefs including Paul Bartolotta, Michael Laiskonis, Nobu Matsuhisa, Eric Ripert, Claude Troisgros, Gordon Maybury of the Loews and chefs from Boulud’s own establishments, including Zach Bell, Jean François Bruel, and Olivier Muller. Another memorable event: the new Wine + Dine + Design, a multi-course seated dinner, presented by Bertolli, Carapelli and Carbonell olive oils, took guests from one culinary hotspot to another in the Miami Design District with stops at Michael’s Genuine Food & Drink, SRA. Martinez, Fratelli Lyon and Pacific Time. The evening was topped off by an after-party, presented by Thrillist, at Ornare, featuring Champagne Lanson, cocktails by Diamond Vodka and Sweet Street Desserts. The Wine Spectator Wine Seminar Series and Bank of America Lifestyle Wine and Spirits Seminars at this year’s Festival were as impressive as ever, with more than a dozen seminars held throughout the weekend at the W South Beach and Gansevoort South, featuring aficionados like Josh Wesson, Kevin Zraly, Gary Vaynerchuck, and Joe Bastianich. Sunday’s events raised the bar, quite literally, with Paula Deen’s Kiss My Grits Sunday Jazz Brunch at the Loews, featuring Paula and friends Katie Lee, Chris Lilly, and Elizabeth Karmel, who rustled up vittles way beyond traditional fare. Joe’s Stone Crab was the setting for another over-the-top brunch that’s become a Festival favorite, Joe’s Big Chill. Guests enjoyed platters of iced stone crab claws served with Joe’s famed sauces and sides with cocktails provided by the House of Canella to wash it all down. A closing night party in true South Beach style, hosted by Food Network’s lovable Guy Fieri, brought the house down, with hundreds partying on the private beach behind the Gansevoort South on South Beach, feasting on delicious Cuban comfort food and sipping Gnarly Head wine, ocean-side, under Miami’s magical moon. Mark your calendars: Dates for the Festival’s 10th Anniversary are set for Thursday, February 24 through Sunday, February 27, 2011. The 2011 Festival will certainly be unforgettable, as it will also celebrate the release of the official Food Network South Beach Wine & Food Festival cookbook (Clarkson Potter), due for publication in November 2010, written by Lee Schrager with Julie Mautner, featuring a foreword by Anthony Bourdain. Returning Festival favorites and new programming is in the works. Keep up to date all year long at www.sobewineandfoodfest.com or www.twitter.com/Lee_Schrager. All proceeds of the Festival benefit the students of the Florida International University School of Hospitality and Tourism Management who also assist Festival organizers with sponsorship fulfillment, restaurant and exhibitor recruitment, logistics, and inventory as well as working alongside some of the world’s greatest celebrity chefs and winemakers. The Food Network South Beach Wine & Food Festival presented by Food &Wine is produced by Florida International University and Southern Wine & Spirits of Florida with the support of the Miami Beach Visitors & Convention Authority and the Miami-Dade County Department of Cultural Affairs. For more information about the Festival, visit www.sobewineandfoodfest.com or call 877-762-3933. For more information about Florida International University visit www.fiu.edu, for the School of Hospitality and Tourism Management visit www.hospitality.fiu.edu and for more information about Southern Wine & Spirits visit www.southernwine.com. Courtesy, of the Virginia Wine Lover E-Newsletter. King Family Vineyards was awarded the 2010 Virginia Governor's Cup for their 2007 Meritage. Over 200 entries from 61 wineries entered the competition, which took place at Lansdowne Resort on January 23. This year the Virginia wine industry changed the Governor's Cup competition from previous years. Only red wines were tasted (medals listed here). A total of 126 medals were awarded including 15 Gold, 53 Silver, and 58 Bronze medals. The biggest surprise was the rise in medals awarded to Petit Verdot wines, which is starting to surpass Cabernet Franc as the dominant red grape in the commonwealth. A welcome change. Pictured above: Gov. 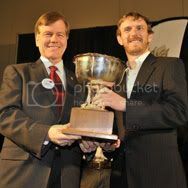 McDonnell awarding Matthieu Finot of King Family Vineyards the 2010 VA Governor's Cup. Photo courtesy of Karen Kabatalo. Yes, we haven't focused much on the wine that was served at the South Beach Wine & Food Festival - mainly because there are so many other choices. But wine is an integral part of the event, starting with The Celebrate France! Pavilion held in the Village. Attendees didn't have to wait for the Grand Tasting tent to open in order to sample nice wines. Inside the tent were wines from obscure regions such as Languedoc, sparkling wine, dry roses from Château d'Esclans, and even box wine. All the while displaying the diverse richness of the French wine culture. And in both tents, the Loire Valley Wine Bureau was pouring samples from this esteemed region. They were also instructing the audience about the sub-regions. Chinon produces Cabernet Franc and Chenin Blanc. Ask for a red Sancerre and expect a Pinot Noir; ask for a white Sancerre and expect a Sauvignon Blanc. The same for a Pouilly-Fumé; but a white Vouvray would land a Chenin Blanc. These wines were sometimes old world - earthy with minerals - and sometime new world - bright and fruity. Hopefully people left with more knowledge about the region. Other countries were represented as well. There was plenty of Italian wines, some from Argentina, some from Spain, and even a collection from Greece. Try pronouncing some of their endogenous grapes: Xinomavro, Aidani, Tsaoussi. And yes, there were plenty of American producers - mainly representing California. However there were a few non-California wineries. Bedell Cellars was demonstrating that quality Bordeaux styled wines can be produced in Long Island and local Schnebly Winery was proving they could produce an avocado wine. Better to make the wine than allow the produce to rot in the field. Actually it wasn't too bad - its made try - but the avocado finish made me crave salt. Maybe pair with chips and salsa. Schnebly also had a selection of fruit wines that received a better reception and showed that you have to make do with what grows in your environment. As for the California wineries, we spent the most time talking and tasting with the folks from Paul Dolan Vineyards, including Mr. Dolan himself. He is at the forefront of the bio-dynamic movement and can teach Oregon wineries about sustainability. In fact he jump ahead of the organic train long ago. We have discussed the wineries unique practices in the past, but most shouldn't be unique and should actually be a best practices for the industry. Use natural predators to evict insects and rodents; not pesticides. Use natural remedies such as chamomile and oak bark. Plant covering crops. I even like how they allow sheep and cattle to graze in or around the vineyard to reduce weeds and for fertilizer. But business success still depends on selling quality wine. Yes, the grapes are healthy - but is the wine? They were pouring their Dark Horse Vineyards, Mendocino grown bio-dynamic wine, Deep Red - a Côtes du Rhône styled wine made from Syrah, Petite Sirah, and Grenache. This is a great wine, fruity yet it retains some of the volcanic minerality. They were also pouring a pair of their organic wines - but I kept reaching for the Big Red. Nicely done. There were several other American producers, many that we avoided at the Grand Tasting knowing we would revisit at the Best of the Best. As we posted previously, these are outstanding wines and we concentrated on the Pinot Noirs from Pali Wine Company, A. P. Vin, Hanzell Vineyards, and Roessler Cellars. All mouth watering, velvety, and silky smooth. Add in offerings from Burgundy and Sancerre and New Zealand and you can see why this wine varietal continues to soar. "Many wineries that lost 80 percent of their production are publicly saying just 15 percent was lost," said one wine executive who spoke on condition of anonymity, citing the fear that distributors would cut off wineries thought to be most heavily damaged by the quake. "This is an incredibly touchy subject." Plus this is harvest time in Chile and many vineyards lost storage vessels. Those in hotter regions lost the ability ti irrigate vines. As the grapes turn to raisins expect more late harvest styled wines. Growing grapes and making wines have always been tedious, uncertain, and difficult. It is even more painful now for the Chileans. Wine is not the only beverage served at the South Beach Wine & Food Festival. In fact we spend more time tasting the many spirits that are displayed - either neat or within one of the many cocktails created just for the event. 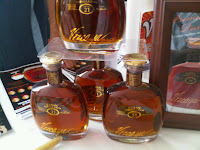 Our favorite brands are always on display and that means Ron Zacapa, Vizcaya, Diplomatico, and Ron Barcelo. We have described these rums at previous tastings here and here, so we won't repeat ourselves here. There was one new brand via Diplomatico, the Diplomático Blanco Reserva - a nice white rum. It is a blend of light and heavy rums distilled in copper pot stills that have been aged up to 6 years. The product is then charcoal filtered creating a very smooth product; very little burn when drinking neat. At their table, Ron Zacapa was offering an awesome strawberry concoction that we may have indulged a little too much. Needless to say, these are the bomb; every liquor cabinet is incomplete without at least one of these. The biggest surprise in rum was sampling our first Panamanian version, the Zafra Master Reserve 21 year old rum. 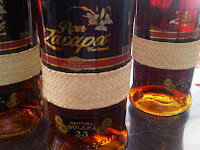 It is imported by Dana Importers who also introduced the Zacapa rums into the U.S. market in 2001. What I particularly liked about this rum is how it transposed itself when adding a drop of water. It seemed nuttier with even a bit of chocolate. Apparently Master Distiller Pancho Fernandez knows his craft. The two main rum sponsors for the event were Cruzan Rum and Malibu Rum. The later is distilled in Barbados and is best known for its Coconut Rum made with natural coconut extract. 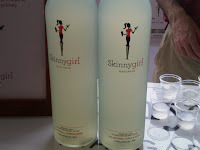 During the grand tasting they were serving several drinks - the blend of coconut and pineapple being my favorite. Cruzan Rum is distilled in Saint Croix, U.S. Virgin Islands and hosts the "dance" party. Wherever reggae music is involved, there's a dance party. Cruzan is one of our everyday rum brands - particularly for blending - although they have a nice selection of affordable dark rums: Cruzan Black Strap Rum (Navy Rum), Cruzan Single Barrel Rum, and the Cruzan Aged Dark Rum. All are nice for sipping and we suggest them all. And too bad they were not located inside the tent so that we could compare their Navy Rum with Pusser's. Another of our everyday rums is Bermuda's Goslings Black Seal Rum. They were present serving the Bermudian Dark and Stormy. No ginger beer for me - no need to get gassy at this event. But love the rum. There was a larger presence of Vodka producers at this year's festival - including three domestic producers. This was an interesting tasting experience because the vodkas differed with ingredients, (rye, wheat, even corn) and distilling method. Tito's Handmade Vodka is produced in Austin at Texas' first and oldest legal distillery. It's made in small batches in an old fashioned pot still by Tito Beveridge. It is micro-distilled in an old-fashioned pot still six times. Sobieski Vodka is the #1 premium vodka in Poland and one of the world’s bestselling and fastest growing vodka brands. It is produced exclusively from the revered Dankowski rye at the Starogard Gdanski distillery dating back to 1846. The Sunshine State is now be home to the world's first vodka you can "squeeze" - 4 Orange Premium Vodka - a super-premium vodka distilled exclusively from pure Florida oranges. Crafted at Florida's first registered distillery, Florida Distillers Company, this revolutionary orange-based vodka embodies the essence of Florida. 4 Orange is distilled from 100% orange spirits derived from four unique Florida orange varieties - the Hamlin, Parson Brown, Temple and Valencia. One 750 ml bottle of 4 Orange contains approximately twenty Florida oranges. From the 18th century comes a flawless vodka imported from Schiedam, Holland—the world’s first center of distillation excellence. For seven generations, our distillery has used the finest whole grain wheat to perfect the time-honored process of single batch distillation. Distilled slowly, in small batches using natural artesian water, the result is a subtle, flawless vodka. Multiple distillations depending on the distiller's opinion. Every now and then, something comes along that raises our standard of excellence. The Diamond Standard Vodka is the world's premier luxury vodka. It is hand-made to a higher standard than any other vodka in the world. Crafted in small batches at Poland's historic Polmos Siedlce distillery. Distilled four times and filtered by thousands of De Beers® diamonds for exceptional purity. Each perfume-grade glass bottle is appointed with a round-cut 25 mm Swarovski crystal from the crystallized elements collection. Experience the new standard in vodka. Introducing, in limited quantities, The Diamond Standard Vodka. Krome is the culmination of a quest to find the world's best vodka. After a yearlong search, it turned out that the best vodka was being hand crafted right here in the United States, in Bend, Oregon. Born of Cascade Mountain spring water and locally grown corn, Krome Vodka starts with superior ingredients. It is then filtered five times through charcoal and crushed volcanic rock. Corn provides the vodka with a heft that can't be found in a rye or wheat vodka and a sweetness that can't be found in potato vodka. The ultra-clean Cascade Mountain spring water and thorough filtration process gives Krome its incredible smoothness. This combination of first-rate ingredients and hand-craftsmanship make Krome Vodka a world-class spirit. In addition to being an award winning spirit, Krome Vodka is gluten-free. OK, there's the marketing fluff. But these are good vodkas. The Four Oranges is the least refined, but its much better than a flavored vodka. You can really taste fresh oranges. The Krome Codka may have been the first we tasted made from corn and we were expecting a corn whiskey flavor - nope. 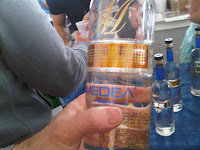 The Medea Vodka stands out with their programmable label - yes you can spell your name and watch it loop around the bottle. Sobieski Vodka is still our favorite - but these are close, close behind. Drinking so many vodkas came at the expense of the cachacas. We really didn't spend that much time focusing on this Brazilian treat. In general, cachaca is made from distilling the juice from the pure sugar can - no converting the cane to molasses like most rums. 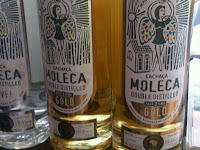 Our friends at Cachaça Moleca were present and as always were making several drinks. According to our female editors, their Caipirinha and strawberry concoctions are always worth the calories. Yea, their Caipirinhas are good, but I prefer their Gold neat. Sagatiba Cachaca is another brand we've tasted in the past and fortunately we had several at the Guy Fieri Closing Party. They were serving their Sagatiba Velha neat, with a strawberry and cayenne pepper\sugar mix. That is an interesting combination. 100% Blue agave tequila , agave nectar lime juice and triple sec. Once again our female editors liked the caloric information - only only 100 calories per four-ounce serving. Registration is open for the second annual 2010 DrinkLocalWine.com conference, set for Loudoun County, Va. on April 25. We've got panels! We've got seminars! We've got lunch! And we've got the second annual DLW Twitter Taste-off -- and we're working on a a big surprise for the Taste-off. Note to the slow of registration: We've doubled the the number of people we can register, but we sold out two weeks before last year's conference in Dallas. Go to DrinkLocalWine.com and click the blue button to register. Price is $65, which includes three seminars, lunch, and the Twitter Taste-off. Taste-off participants must be 21 or older. Questions? Call (978) 276-9463 or send an email. The beneficiary for the South Beach Wine & Food Festival is the Florida International University's School of Hospitality. Last year we discussed the history of the festival and how it has impacted the school. Click here for that description and a summary of the student's involvement in the festival. This year was no different - except they were offering more beer choices for the 53,000 attendees - nine total. Dr. Gump, Director Beverage Management, explained that the students either made the brew at home or used facilities at the university. Regardless, each student chose the style and ingredients - the barley or rye and the hops - and paid for it themselves. Jenifer Miller was the Beer & Wine Tasting, Grand Tasting, Coordinator and my favorite brew was her IPA a hoppy ale but cleansing. A nice west coast style. She also made a Belgium styled white ale which was made in the amber style. Not as nice as the IPA, but decent. I tried two other student's creations. David has created Rachel's Rye Ale which was really nice and the final I tried was Daniel's Pale Ale. All nicely done. The students were also pouring the remnants of their Merlot which was bottled in October 2008. This batch of wine has produced six different wine styles which showed the students how winemakers can prolong the life of a batch. In addition to the wine, the students prepared food for the attendees to the Grand Village as well as participated in numerous events throughout the festival. In sum 850 majors participated. Some fortunate ones were paired with, in a mentorship style relationship, the following chefs: John Besh (Restaurant August, New Orleans), Scott Conant/Michael Priolo (Scarpetta/ Miami Beach), Todd English (Olives, NYC), Adam Perry Lang (Daisy May’s BBQ, NYC), Emeril Lagasse (Emeril’s/New Orleans), Masaharu Morimoto (Morimoto, NYC), Tom Neely (Neely’s Bar-B-Que, Memphis), Alfred Portale/John Suley (Gotham Steak, Miami Beach), Sue Zemanick (Gatreau’s, New Orleans), among others. That's some nice experience. Others worked less glamorous jobs, like clearing wine samples between seminars or handing out wine glasses at Best of the Best, or serving during the Burger Bash. Regardless, their effort benefited the School of Hospitality. According to this report, the school profited $2.2 million. That's a nice four day payday. While attending the SIBE Soundcheck, sponsored by our friends at Seven Daughters, we were able to spend time talking to Geoff Manthorn and Chef Duff of the Food Network's Ace of Cakes. Besides being bakers, they are both aspiring musicians and frequent several of the north Baltimore music venues such as the Ottobar. 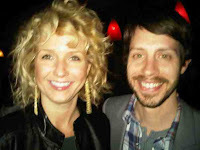 Geoff prefers folk and bluegrass and you can check out his acoustic work via his myspace page. I asked about his favorite Baltimore brewpub and he quickly responded with Brewer's Art. His favorite beer: their Abbey-style Resurrection. 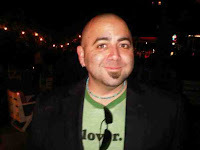 Chef Duff likes a more harder sound and is a member of Soihadto - a cross between Pink Floyd and Radiohead, without the vocals. Yes, just music; interesting.... They have a show scheduled for March 13th at McGrady's Irish Pub - Charlottesville, VA in which we will make an effort to attend. We also asked Chef Duff who he's currently listening to and he introduced us to A Night in the Box, a trioka from Minneapolis who play "Americana-infused soul and bluegrass". Right up our alley. In return we suggested he see The Reverend Peyton's Big Damn Band's show at The 8X10 on March 18th. We hope to see the entire crew there. I have been stalking Doug Frost for a number of years now for a number of different reasons. First, he is the most knowledgeable wine "geek" I know. "In 1991 he passed the rigorous Master Sommelier examination and two years later became America’s eighth Master of Wine. He was the second person in history to complete both exams and sixteen years later he is still one of only three people in the world to have achieved both these remarkable distinctions." He knows his stuff. Second, he cares about non-traditional wine grapes, whether grown in the United States or elsewhere. Ask him about Norton. Third, he's a champion of Riesling. Fourth, we share a common philosophy to find the most value wine in the most unique regions. Fifth, he overseas the Jefferson Cup. And finally, after spending an hour listening to him lecture, you want to spend more time conversing over a glass of beer. For this year's South Beach Wine Festival he volunteered to lecture on Spanish wines and drew a large audience for a Sunday morning. 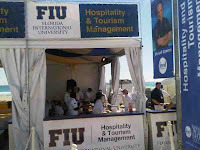 Even colleague Dr. Barry Gump took leave from Florida International University's School of Hospitality booth to attend. Frost had selected ten wines for us to sample neatly placed at each setting. He immediately instructed us to start sipping and not to wait for him to describe the wines. He wanted us to gain our own impression before "tainting" it with his. We started with two Cava sparkling wines and found that the region is the world's largest producer of methodoise champagne wines. The first was light and acidic, the second fuller and dryer - and made from mostly Pinot Noir. That the wine was made from a traditional Rhone grape was a surprise which led Frost into a soliloquy on what leads to a great wine. It starts with finding a grape that takes the longest time to reach maturity. For instance Chardonnay in the Central Valley of California reach maturity in July - and then lose flavor as the grapes sit on the vine for two more months until harvested. Yet Chardonnay grown in cooler Napa and Burgundy mature much closer to harvest. In the case of the Freixenet Elyssia Pinot Noir Cava, Pinot Noir grows quite well in Penedas. The same holds for Albarino grown in Galacia - and the region is too cool to make wines with "pinch". Thus in Galacia, the grow Albarino - as well as some indigenous grapes we tasted a few weeks back at the Washington D.C. Wine Festival. Frost informed us of an interesting aspect of the Galacian culture - which is Scottish. Over 2,000 years ago the region's descendants immigrated to the area. Interesting. 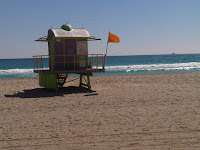 The Morgadio Albarino 2008, DO Rias Baixas wine was light, but with refreshing acidity - a perfect match for South Beach. Next was a completely different wine style, a full bodied Viognier that was smooth and silky - one of my favorites: Pago de Vallegarcia Viognier. This wine was just as good as one made in the Rhone or even Virginia. Another factor lengthening the growing season is the presence of temperature variations during the course of a day. Spain is the third most mountainous country in Europe - following Switzerland and Albania. Grapes planted on the slides of slopes benefit from sunshine during the day and then a sharp plummet in temperatures in the evening. The Bierzo region benefits from this variation and we tasted a nice Pazo de Arribi Mencia. This wine had the most objections from the audience when Frost asked who didn't like it. He usually started with objections since its more likely if someone likes a wine, they are not sure why - its just pleasant to them. Whereas if some doesn't care for a wine - they know immediately. For many, this wine was too earthy, minty, and quite a tart change from the first group of wines. Our first Rioja wine was the Bodegas Breton, Dominio de Conte Reserva 2004 - a fuller wine and even more acidic and tart than the previous. The cool Rioja nights produce more acidic wines. We moved on to a Tempranillo, the Bodegas y Vinedos Fernandez Rivera, Dehes La Granja 2003 from the Castilla y Leon region. Another favorite followed, the Pango de Vallegarcia Syrah from Castilla la Mancha. Like the Viognier, this wine is made for the international market and tastes more like a California wine than an old world wine. The Castilla la Mancha is a warmer region that produces riper grapes. The biggest wine was the final red, the Mrlanda Crianca 2004 from Prirat. This grenache wine is less acidic than the other reds and is currently a trendy wine region. The final wine was a muscat dessert wine, the Bodegas Gutierrex de la Vega, Casta Diva Cosecha Miel 2008, DO Alicante. Get used to the long names for Spanish wines. This was a nicely done dessert wine, tart and cleansing - not sugary. While the FIU student volunteers cleared the room for the next seminar, I re-sampled the wines again. For someone who thought they generally preferred old world styled earthy wines, it was surprising that once again I preferred the two wines developed for the international market - the Viognier and Syrah. But the other wines are worth purchasing as well and we will continue to investigate wines from Galicia, Bierzo, Rioja, and Priorat. Thanks Doug for another informative and entertaining lecture. Hope to see you back next year. Once again the South Beach Wine & Food Festival was a hit - from the Grand Village, to the tasting tent, wine seminars, Seven Daughters SOBE Soundcheck, and the Best of the Best. Although the final event, Guy Fieri's Luna En Fuego Party was sort of lame. Good DJ, cupcakes, and cachaca - but way too crowded. Particularly when something free was involved - plenty of pushing and shoving to receive a free Havaianas flip-flop. My favorite event was Doug Frost's Wines of Spain seminar. I'll post more about it later, but he is such an entertaining and knowledgeable speaker that the hour flew by before I could finish all the wines. Nice to find out we share a common interest in Galacia wines. The Best of the Best and private SOBE Soundcheck were also entertaining events - although this time for the later the crowds weren't the problem; the music was lame. No emotion. But we did get a chance to spend time with Geoff and Duff from Ace of Cakes - more from that conversation coming later as well. We want to thank the media coordinators for this event for their generosity and patience and to all the production personnel and volunteers who make this such as well run festival.